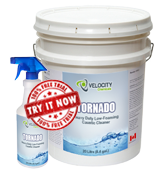 TORNADO is a heavy duty low foaming caustic cleaner that can be applied in a variety of ways. It is used by pulp and paper, forestry, transportation and mining companies, railroads and engine repair shops. TORNADO can be used for cleaning dryer hoods and doors (pre-soak), exteriors of locomotives, rail cars, trucks, truck frames and blocks; effective on soiled engine parts, painted truck bodies (low concentration), floors, and in drive-through vehicle and locomotive washers. May be used in food and fish processing plants. Pre-soak – use from 10%-100%. Apply with low pressure up to 100psi. Allow contact time up to 4 or 5 minutes, depending on soil condition. Pressure washing – dilute to 0.3-1.0% at the tip depending on surface soil condition and temperature. Floor & equipment cleaning – use at 5-100% depending upon surface soil condition and temperature. Foaming – use at 5-20% depending upon surface soil condition and temperature.